1: The beach – yes it is a little cheap, I know, because the beach is always a great place with the kids – no matter what size they are. There are numerous “beach-shops” near the beach, where you can buy different equipments ranging from bucket, shovel and sieve, float-gizmos, giant inflatable sharks and boats – yes, in Turkey you can get everything. I would recommend that you mainly head out to one of the two major beaches in the city – Lara or Konyaalti (which you can read about here). I haven’t yet written about Lara for the simple reason, that I do not have decent pictures of the beach (and I have the most and best to say about Konyaalti). At Konyaalti there is at one end a beach park, so you can be provided with food and drink and lots of sports, if you’re into it. So the beach covers all ages. And isn’t the reason why you have taken on vacation, that you want to relax and enjoy the beach and hot water? 2: More water – as the water park! 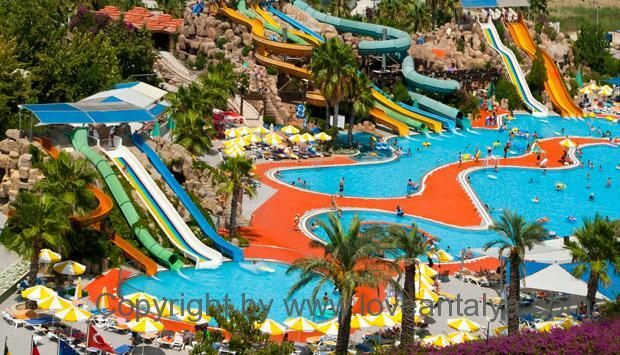 Antalya has 3 entire water parks, so there is something to choose from. It has been many, many years, since I have been in the water park in Antalya, so I sincerly hope, that it has developed (although it was a good experience). I’ve heard best about the water park, which lies closest to Konyaalti beach (and it has also received the most stars, when searching on google). The security should be in the top everywhere and you are guaranteed some wild experiences – somehow the Turks don’t understand how to limit. The parks hides cornucopia of slides, large pools, fountains, waves, music and food. So it’s just to jump on board. 3: If you’re into a little more quiet activities, you can take a walk in the butterfly park, located near the airport and Lara Beach. The park opened last fall, so it is still quite new, and I have therefore not had time to visit it. But it sounds interesting, as they have many different species (up to 150 species from 30 different countries). If you are good with Turkish, you can see more on their website (why it is not translated into English is beyond me). 4: More water – for yes, you are as close to the sea as you can get. 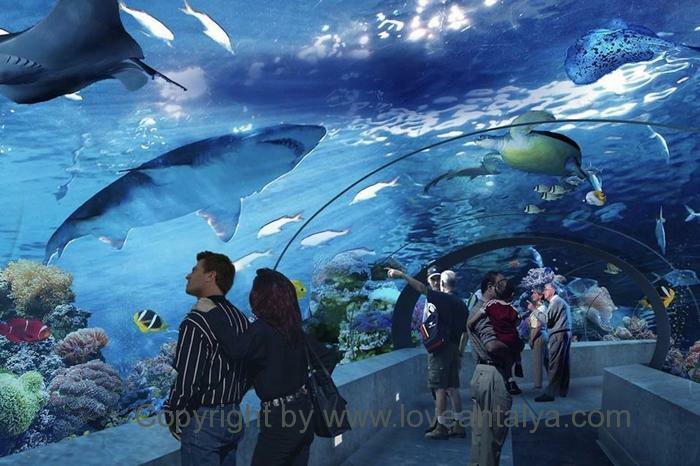 Antalya Aquarium – is a huge project that started only 70 meters from the Konyaalti area some years ago. It is one of the largest aquarium complexes in the world with their 40 pools and a giant tunnel beneath one of the pools. It’s entire 131 meters. Besides the fish and the sharks there are a lot of activities such as playing with snow (!! ), a reptile park with poisonous animals and the opportunity to become 3D captain of your own ship. Hmm … it seems that there are some detours (frankly, snow in an aquarium ?? 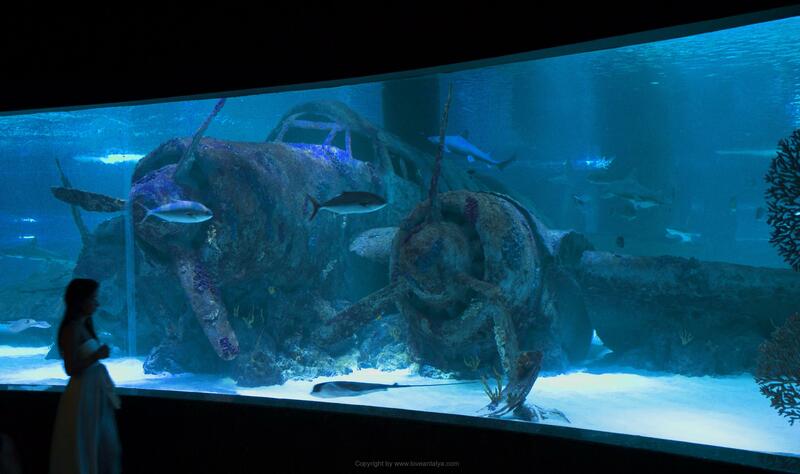 ), but it is certainly a place, that I will entice the family to visit in the summer. I think, it sounds really exciting and promising, and that it has won Travellers Choice three years in a row can also count on the bottom line. Their website is in turn surprisingly good (just could not find anything about prices). You can see it here. 5: The Gold Street – yes, it says it all and so it’s named home with us. The Gold street is as such no definite attraction, but if you still need a trip around the old town, you might as well just go to the gold street aswell. For there is nothing like the purest, most shining 22 and 24 karat gold, which can turn the wildest dreams of treasure hunts and pirate ships with the smallest ones (and it could be fun to tell the kids a “story from the tropics” – just when you now have the chance). 6: If you have to be in the slightly more adventurous world, a visit to Olympos mountain is a really good idea. But not for very young children (and people in poor health), as it requires a hike up the mountain – about 1km up the rock stairs. But at the top you will be rewarded by flames coming up the mountain (and of course a phenomenal view) !! 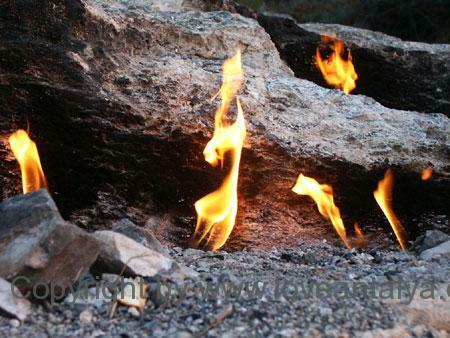 The flames have done so for about 2500 years. Impressive. We need to get the kids up there for the summer, and I am really looking forward to seeing it (last time I was pregnant and was not fit to climb). Of course it is best to see in twilight (though you can easily see it during the day). I have not yet written about the place, but search for “Olympus mountain” or “Yanartas”, then you should be able to find it. 7: Karaalioglu Park is a lovely oasis in the middle of the city. 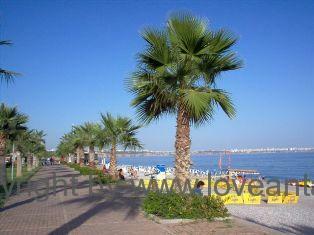 Here there is fresh air on a hot summer day, and therefore it is a popular park among the locals. The park has over the years become only more and more beautiful, with tall beautiful trees and palm trees, flowers, large open spaces and benches, where you can sit. The promenade ends in the most beautiful view of Antalya Gulf, and there are playgrounds and small tea houses, you can sit at. If you are lucky, there may be a small theater or a concert going on. A really nice break from the traditionel holiday. And you can easily go straight there, if you are in the old town Kaleici. 8: Take a walk at the bazaar with the kids. It’s super fun and with a lot of colors, sounds and exciting things to look at. Just to see how things are stacked up, all the spices and the gorgeous carved watermelons, is a completely different thing for them, and probably something they remember, when they get older. I’ve made a guide to find one of the good local bazaars- you can find the guide here. 9: I should have taken money every time, my kids have begged to visit the tivoli, but their Dad always said no : / But now it should be. 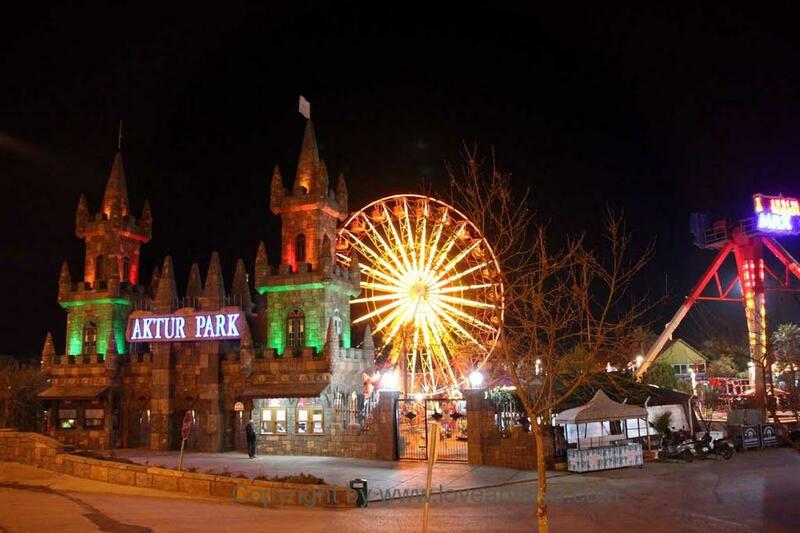 Aktur Park Antalya is just opposite the large Migros 5M mall. And it has gradually evolved to become a major park with many exciting rides ex. ghost train, Ferris wheel, roller coasters, bumper cars, diff. games and so on. Especially in the evening you will be attracted by all the many beautiful colored lights. It’s are not expensive there – around the 5 lira per. trip. 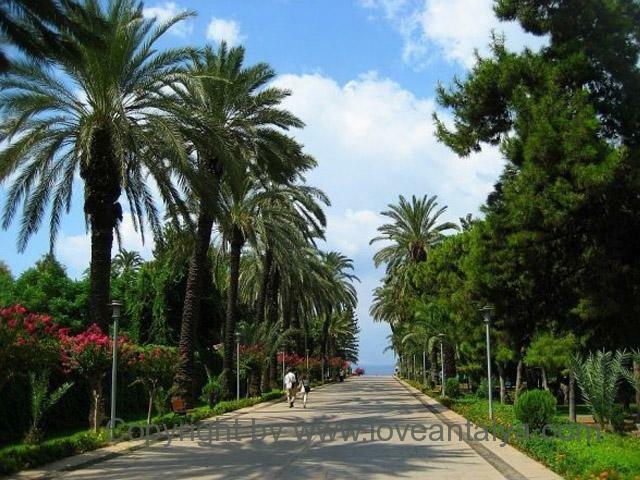 10: Antalya Kent Ormani is a very local park, without very many tourists. But it’s super cozy, and it is a much-used park by the locals for picnics, breakfast on weekends, enjoying the magnificent views of the city (the park is on a plateau just before the mountains, but a little above the city) and it has a fine, but a little primitive outdoor playground for kids and playful adults. There is also the opportunity to play paintball. Given that it layes above the city (and about 15 minutes drive out of town), there is a little cooler here, than down in the city. It’s free to enter.